We’ve not held back on our enthusiasm for the Google Nexus 4 smartphone, despite difficulties getting hold of it through the Google Play Store. At last though it seems that many orders for this LG-manufactured phone are starting to arrive and if you’re fortunate enough to have finally received your order then you may want to protect your Nexus 4 with a case. If you’re a fan of minimal cases for your devices then you may well be interested in the Spigen SGP Nexus 4 Case Ultra Thin Air series. The Ultra Thin Air cases are available for various flagship devices and the Nexus 4 version in black is now ready to order. It’s thin and hardly adds any bulk at all to your phone, something that many people favor when looking at case accessories. It also lays virtually flush with the sides of the Nexus 4, however there is a very small lift to the front to prevent scratching if laid face down. The Ultra Thin Air case for the Nexus 4 is made of durable non-toxic polycarbonate with a UV matte finish so it should feel good in the hand and also easy enough to get on and off. This Spigen case should give reliable protection from dust and the normal impacts, bumps and scratches of everyday life but still gives access to controls and ports. 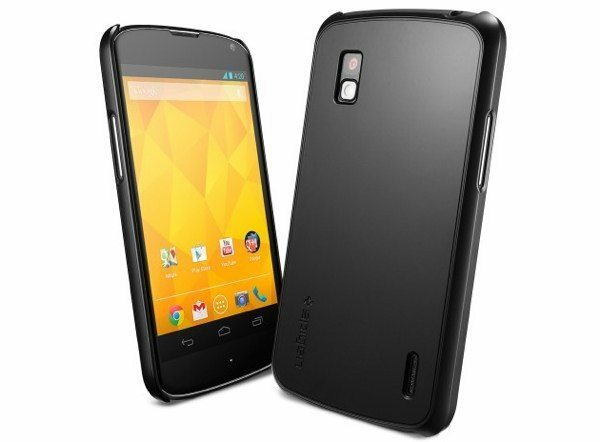 The price of the Spigen Ultra Thin Air case for the Nexus 4 is $19.99 and that includes a cleaning cloth and screen protector. For a closer look or to order the case, head to this Spigen SGP product page. We’d like to hear what you think about the Ultra Thin Air case for the Nexus 4? Does the price seem reasonable for the peace of mind this will give you? Let us know with your comments. As is everything on this “news” website. Gotta remember to ignore this stupid place. I think it’s worth it if I didn’t have a screen protector already or I just want a fresh look for my screen.